If you keep finding advertisements that are identified with the tags "Ads by SquareTrace" and "Provided by SquareTrace," there is no doubt that an advertisement-supported program was installed on your operating system. If you are not sure how it managed to get in, it is possible that you have installed it by mere accident. This is not difficult to do if you do not pay attention to the software you install. We have prepared this removal guide to help you remove SquareTrace from your Windows operating system. The first thing that most computer users do when they want to learn more about SquareTrace is visiting the official website squaretrace.info. It is unlikely that many users are familiar with this site, because the installer presented via it doesn’t work. All in all, we do not recommend paying too much attention to the promises expressed via squaretrace.info, because they are meant to convince you that you don’t need to delete SquareTrace. Our malware researchers are confident that you do need to remove this adware; otherwise, it will keep showcasing completely unpredictable ads. Even though at first sight SquareTrace might look like a genuine and helpful application, our malware researchers didn’t need to dig deep to realize that this is an unreliable ad-supported program that requires removal. This unreliable adware is a clone of Traxxen, Swift Record, Special Box, and a bunch of other unreliable SuperWeb LLC applications. All of these apps deserve removal, because they do nothing else but connect to untrustworthy adware servers and enable suspicious ads to appear on the web pages you browser. If you remove SquareTrace, you will not have to deal with these suspicious ads. If you delete SquareTrace successfully, you will also get rid of the tracking cookies. Tracking cookies are used to collect and store information about your virtual activity and your operating system. In extreme cases, tracking cookies can also collect highly private information, which is why you have to be cautious about them. If you do not want cookies associated with unreliable software spying on you, we advise removing them. If you cannot remove SquareTrace from your operating system yourself, you need to install software that will help you with the removal of SquareTrace components. Legitimate and trustworthy automatic malware removal software can delete SquareTrace from your operating system with all of its components. Moreover, this software can remove other unreliable apps, if they were installed bundled with adware. 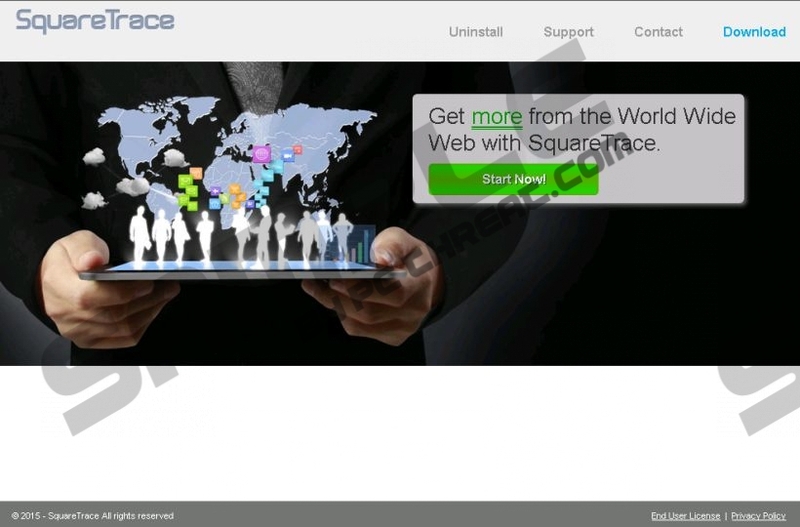 If you wish to remove SquareTrace manually, the guide below is a good start for this operation. Click Start on the left of the Taskbar. Select SquareTrace and click Remove. Go to Uninstall a program and right-click SquareTrace. Select Uninstall to delete this adware. Quick & tested solution for SquareTrace removal.